Filip Perkon speech on opening RBW-2011. Source: RBW @ Facebook. A recent conference in the UK attracted a strong contingent of Russian politicians and businessmen to discuss the situation in the country and what can be done to improve investment. 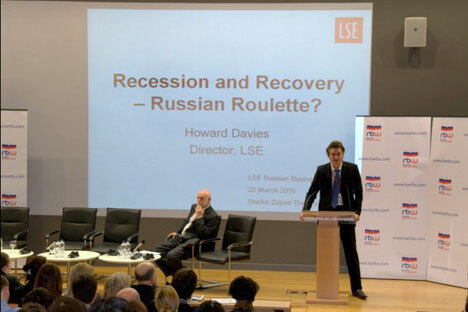 Two weeks ago I had the pleasure of attending Russian Business Week (RBW) at the London School of Economics (LSE) after seeing an advertisement on the RBTH website. In previous years, I had seen RBW advertised, but there was always something that prevented me from attending. This year, I was in London, and once I saw the speaker line up and realized RBTH was a media sponsor, I knew I had to go. About half of the event was free, with certain days requiring paid registration including the opening ceremony with Russian Foreign Minister Sergei Lavrov, and the last day of the event that included a champagne gala reception. Before I outline what was said and my thoughts on the week’s events, I would like to provide some background on RBW. It is the brainchild of Filip Perkon, who created and launched RBW in 2007. It is a yearly event, roughly around the same time each year, with an impressive array of speakers who give lectures and answer questions. When I first heard of RBW, I assumed it was a global event, a bit like Global Entrepreneur Week. In fact, RBW is an event specific to LSE, and it has quickly become one of the main attractions on the LSE society program. At the end of the event, Filip announced on stage that it took 6 months to put the event together, and I can believe it. Russia and the UK have only recently had a thawing of diplomatic relations, and to attract someone as high profile as Foreign Minister Lavrov at the event is quite impressive. That said, I believe Lavrov was already planning on visiting the UK this year, and during his time in London he met with his counterparts in the UK government. However, the question of what came first is mute; the mere fact that he was added to the itinerary indicates the caliber of the event. And Lavrov was not the only star attraction—most of the speakers were high profile people in their industries, with the majority holding senior management positions in their respective companies. There was no doubt that Filip and his team put together an impressive array of speakers, but despite this, I was left somewhat wanting when the final day arrived. After thinking about this for some time, I think my expectations of the event were out of sync with organizer’s intentions. I attended the event thinking that most of the talks and lectures would be specifically about doing business in Russia and how companies and institutions from abroad could work better with Russia. Of course this was addressed to large extent in the talks, but there was also a heavy dose of self-promotion and a broad assessment of global issues. An example of this was the fantastic talk by Vladimir Yakunin, the President of Russian Railways. Now I say fantastic, as I have never actually experienced such a mesmerizing lecture before. In short, Yakunin talked philosophically about the global crisis and went on to show how his research team was predicting (with a number of complex indicators) when the next crisis would occur. Now although the talk was fascinating, once you come down to earth you start questioning what it has to do with Russian business. In a broader sense, of course, it is connected, but in reality, this sort of lecture is best left to academics rather than businessmen—and this is where my expectations were misplaced. RBW is an event that targets LSE students, with the majority of the audience coming from LSE. At times, this was quite frustrating especially when it came to the Q&A session. An example of this was during Lavrov’s speech, where there was a prime opportunity to ask some serious questions that could shed light on Russian’s foreign policy and future business plans. Instead, many of the questions were generic and involved issues with well documented answers, such as Russia’s position on the Kurile Islands, or Russia’s stance on China. To think Lavrov would change his view at the event or shed any new light was really hoping for too much, but the questions came, and continued to come throughout the week. Once I realized that the event was geared towards students, I adjusted my expectations accordingly, and I was even able to ask a question about Russian regional politics during the lecture by Boris Titov, Chairman of Delovaya Rossiya and CEO of SVL Group. In short, I found the whole event to be a worthwhile experience once I understood the framework. I think that future events could involve more networking. It would have been great to chat with the speakers at the end of each day, but instead many left early, with the rest either taken to a private room, or being swamped by students and media. I also think the lunch and general organization on the Friday could have been improved, but it’s a large event to handle over multiple days so I can understand that some things will fall through the cracks. Throughout the event, I made notes on most of the speakers, and I have summarzsed their thoughts below for my readers to review. I have written in shorthand, so hopefully people can understand the comments. Russia needs and seeks international cooperation. Britain and Russia need a closer relationship and synergies need to be explored. The two countries are intertwined and the UK is one of the top five investors in Russia. The three core areas the countries should focus on are technology, the business climate and small business support. Russia needs modern technology in services and in the business environment, and businesses need to be better represented at home and abroad. The private sector should be promoted and supported since Russia can’t rely on petrochemicals. Russia has good ideas, but finds them difficult to implement. The BRIC will soon expand and become BRICS with the addition of South Africa. stability, continuity, security. Corruption is the key disease that harms host, but this can be combated by having a robust legal framework. Overall, the key to success is finding the right partners. The zero point analysis that his team has conducted predicts the next crisis will occur in 2022. In 2008, Russian Railways borrowed in 500 million from a UK bank and was approved in four hours. This illustrates that, despite being in Russia at the height of the crisis, Russian railways could still attract international lenders. Russia needs 1 trillion in infrastructure; Russia is investing less and must do more public-private partnerships; Big deals can take one to three years to complete and are usually highly competitive. billion over eight years and has received sustainable returns; London is a place to raise money; The key to success is working with Russia rather than looking to make a quick buck. Russia is similar to other emerging markets. Russia is lower than it should be on transparency index. Russia is a place of high risk high reward. Russia is in competition with other emerging markets. Wealth is not well developed in Russia, and there is a lot of corruption and bureaucracy. Anything in Russia that is state-owned is viewed with caution and suspicion but in places like the UK, the banks that have been bailed out are essentially government-owned. Areas of growth are insurance, retail, construction and utilities. Russia needs to modernize, but there is a shortage of managers. Peter Kaznacheev – Managing Partner and Founder of Khaznah Strategies, Ltd.
East are the big areas to look into in the future. Rio Tinto has profits of 2 billion a month and it invests 13 billion a year, primarily in Asia and Africa—Russia is a glaring gap. Rio Tinto has been present in Russia since 1992 and has a joint venture with Norilsk Nickel. Rio Tinto focuses on diamond exploration in Russia. Russia is strong geologically and in human capital. Russia also has a physical proximity to Asia that is very beneficial. The Russian president plans to tackle corruption. There are serious challenges to overcome, such as obtaining a permit, and research by Rio Tinto confirmed that over 70 permits are needed in Russia to participate in mining industry. Clarity is important, and in many occasions, areas can be confiscated without due process and the seller in many instances does not receive market value. Rio Tinto is continually exploring new technologies, including new mining methods. Infrastructure is important in order to get one mineral from A to B. The weather in Russia is also an issue, and the conditions make mining an intense user of energy. Rio Tinto has partnerships in Tomsk in tunnel boring, mines, sinking, automating mining. Real or perceived, the issues exist in Russia and therefore regardless, the barrier is there. There needs to be more support for SMEs. Russians are suspicious of the west, and there are issues on both sides of the iron curtain. Russia should join the WTO. Russian firms should get capital from London. There were other speakers, but my main focus was on the business-related topics and assessments of social behavior in Russia. I thought all the speakers were fantastic, but my favorites were Peter Kaznacheev and Guy Elliot. It was clear from his lecture that Peter was an expert in oil and gas, and his firm helped put together the BP-Rosneft deal. He was working behind the scenes on this deal for three years. He came across as humble, articulate and affable. Oil and gas is also an area that fascinates me, and it was good to get some of his projections for the future as well as understand a bit more about the industry. Guy also produced a very clear and concise lecture as to why Rio Tinto was not more active in Russia and the issues that he sees as preventing Rio Tinto increasing its presence in Russia. Overall, he echoed the beat of many others that stressed that good partners were needed before any progress can really be made in Russia.